Corsair's recent SSDs have all been based on Phison's turnkey SSD solutions, where Corsair specifies how the drive will look, but the internals of the drive are essentially identical to those of a dozen other brands. Using turnkey solutions like this is by far the easiest and least risky way for a brand to ship SSDs, but it leaves very little room for product differentiation. Corsair's Neutron XTi and Force LE SATA drives and their Force MP500 M.2 NVMe SSD don't offer anything unique under Corsair's sticker. The new Corsair Neutron NX500 uses the same Phison E7 controller as the MP500, but it aims to stand out from the crowd. The Corsair Neutron NX500 is not the first retail Phison E7 SSD to use the PCIe add-in card form factor with a heatsink, but it is the first to reserve a very large spare area, leaving just 400GB usable space on our sample compared to the typical 480GB. This kind of high overprovisioning ratio is usually only found on enterprise SSDs intended for write-heavy workloads. We saw these oddball capacities with the Intel SSD 750, but there it was due in part to Intel's 18-channel controller compared to 4 or 8 channels on most consumer drives. The Corsair NX500 actually has substantially more overprovisioning than the Intel SSD 750. The custom heatsink makes the Corsiar Neutron NX500 visually quite distinct as it carries typical Corsair styling cues. The PCIe bracket is perforated with triangular vents that match the Corsair ONE's side panels, while the rest of the drive is decked in variations on black. We know from our past testing of Phison E7 drives that the heatsink's role is more aesthetic than functional, but as the heaviest SSD heatsink I've yet encountered it should guarantee that the controller stays cool. The NX500 does not include any thermal pads between the heatsink and the flash memory, and there are no thermal pads between the drive and the backplate. The faux carbon fiber plastic shroud over part of the NX500's heatsink could theoretically detract from its cooling capacity, but the wattage of the Phison E7 chip is far too low to for that to matter. The PCB under the NX500's heatsink is barely modified from the Phison reference design. It does actually bear Corsair's name, but the overall layout is identical to all the other Phison E7 PCIe cards we've seen, right down to the unpopulated solder pads for power loss protection capacitors—both cylindrical through-hole capacitors and surface-mount solid capacitors are provided for. A custom PCB half the size could have worked without making the board crowded. The flash is the usual Toshiba 15nm MLC. The NX500 is equipped with twice as much DRAM as is typical for a SSD with this much NAND flash. Quite unsurprisingly given the overprovisioning situation, the Corsair Neutron NX500 comes with a firmware version we have not previously encountered on other Phison E7 products. The NX500 ships with firmware version E7FM04.5, which I'll abbreviate as version 4.5. We've previously dealt with versions 1.0, 2.0 and 2.1, and an upcoming review will feature a 240GB drive using version 3.6. 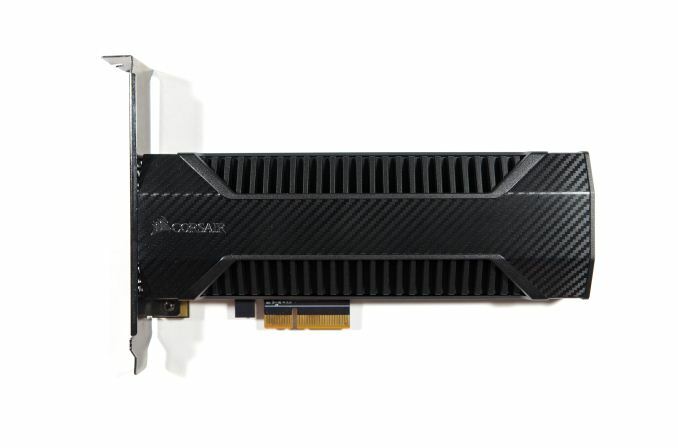 An NVMe SSD in the PCIe add-in card form factor with a big heatsink and using MLC NAND is obviously a niche product for the high end of the market. It makes sense that Corsair's starting the NX500 line with 400GB and 800GB capacities while the more mainstream MP500 M.2 SSD ranges from 120GB to 480GB. Corsair rates the NX500 with a total write endurance of 698TB for the 400GB model (the same as their 480GB MP500) and 1396TB for the 800GB model, but the NX500 comes with a five-year warranty compared to the MP500's three years. Samsung 950 PRO 512GB and 960 EVO 1TB. We don't have samples of the 512GB 960 PRO or 500GB 960 EVO, so these are the closest Samsung equivalents we can provide at the moment. WD Black 512GB and Intel SSD 600p 512GB, entry-level M.2 NVMe SSDs using TLC NAND. One of these is usually the cheapest NVMe SSD available at any given moment. I'm looking forward to the day I can read a SSD review and not come away thinking "...or just buy a Samsung". Agreed. Samsung has been at the top for so long it is just boring. Crucial is still in the game. They just can't compete with Samsung on performance. Nobody can. It's really hard to consider anything else when looking at "new" drives. Samsung and Crucial/Micron are really at the top. Sandisk is decent, but not cost competitive at the high end, and OCZ's has had some good drives for the price lately, but why gamble? "That's why you continue to see more Micron drives in enterprise and business PC's than any other brand (except perhaps Sandisk, in which case they are often the same Marvell controller so the differentiating factor comes down to firmware and in-flight data protection)"
Yeah. Perfromance is one thing but price another and this drive is clearly overpriced. If you want me to use a pcie-card ssd you better deliver something special but this fails.